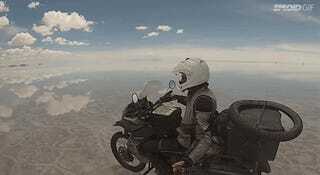 Here’s an awesome video from Speed Society that shows a motorcycle riding across the world’s largest salt flat, the Salar de Uyuni in Bolivia. The ground basically mirrors the sky which makes it look like the motorcycle is just gunning it through the clouds. Not a bad way to spend a day.